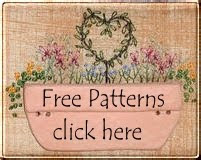 Here is a free stitchery pattern and "how to" tutorial for you to enjoy.The pattern for this project can be accessed by clicking the link below. Click here for your free stitchery pattern "Bee amongst the Daisies"
Iron your background fabric. It is best to choose a light coloured, closely woven fabric such as Homespun or Calico for this project. Use a fine tipped water soluble marker and a good light source. A well lit window will do. Include all the pattern markings including the outer border which is the finished size of the design. You will notice that I have traced lightly. Being too heavy handed will make removing your markings more difficult. You could also use a sharp lead pencil, although pencil can be harder to remove as well. And I should also mention that I do not recommend a permanent Pigma pen for obvious reasons! Click here for more information about transferring stitchery designs. 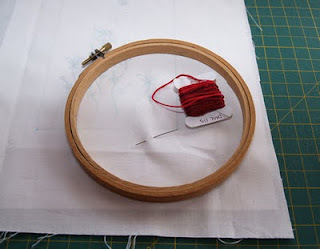 For working the hand embroidery stitches I highly recommend using an embroidery hoop and a number 9 or 10 Crewel needle. The hoop will help to keep your stitches an even tension. Choose a small hoop, my favorite is about 6" or 15cm in diameter. Click here to read more about embroidery hoops. I have used a variegated red DMC thread for this stitchery project, although it would look great in other colour combinations. Click here to read more about threads for embroidery. Now that you have the correct equipment it is time to start working the hand embroidery stitches. 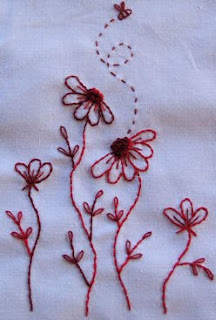 This stitchery project is made up of 5 basic embroidery stitches. Straight stitch, Back stitch, Running stitch, Lazy Daisy stitch and French knots. To help you with these embroidery stitches I have put together a video demonstration of each stitch. 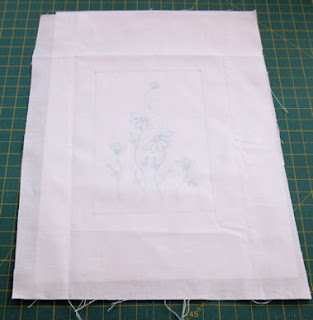 There is also a video to show you how to start your embroidery without having to use a knot, and there are no loose ends to worry about either.Click here to view the embroidery stitches. Once your stitchery is complete, remove any markings with cold water. Press your stitchery face down into a towel. This is important so as not to squash your embroidery stitches flat. Trim back the panel to the desired size. Your stitchery is now ready to make into a small wall hanging or to incorporate into a cushion, bag or quilt. Hope you have enjoyed this free stitchery project. Very nice Lenna, I love redwork. What a pretty design! And how very generous of you to share it and those very good instructions. Thank you! Oh thanks again. I love your designs. I have been working on a couple of those patterns I bought awhile back. 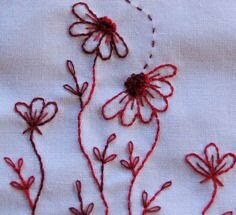 Hi there, I just found your blog and have become a "Follower"....I'm very new to hand embroidery and need all the help I can get so I'll be visiting often. Hi Lenna, I love that sweet pattern, thank you so much for sharing, Anita. Thank you for this winderful pattern just right for the spring seaseon! It's beautiful, Lenna! Thanks for sharing. Kisses from Venezuela. Very pretty Lenna. Thanks for sharing this lovely flower pattern. I just signed up & am so very excited. I have done many of your patterns & just love them. THANKS for doing this & we hope you do it again. I can't wait to get started. Oh, can we make any item or thing of interest or does it have to be that desired size/wall hanging??? Nice patterns!! love those read flowers on a white background. Wow, this is beautiful! Thanks so much for the pattern and tutorial. I'll be linking to this and following your blog!